It’s called Hoosier Hysteria for a reason. 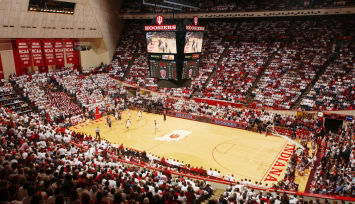 Indiana University has some of the college basketball’s most passionate fans. With 5 National Championships banners hanging from Assembly Hall in Bloomington, this legacy program has a storied on court tradition. And there’s a tradition on-air, too, with veteran announcer Don Fischer. WIBC & 1070 The Fan provide wall-to-wall (or sideline-to-sideline) coverage of everything IU Basketball. Since 1973, listeners have heard his distinctive cadence & classic calls of play-by-play hardwood action for the Hoosiers which now is heard on 93.1FM. In season, tune in to WIBC every Monday morning at 7:15am for the IU Basketball Report – a comprehensive look at everything happening in with the Hoosiers. Join Steve Simpson as he dives in to strategy, recaps, highlights, and predictions from some of the top basketball analysts in the state. Switch over to Indiana’s radio sports leader, 1070 The Fan, to hear in-depth analysis on players, coaches, and games from some of the best in the business including former IU Basketball Player and IU Basketball Coach Dan Dakich – heard everyday on 1070 The Fan from noon to 3pm.